Microsoft CEO Satya Nadella sent a letter to employees detailing the company's future. In the note, Nadella said Microsoft will emphasize the Internet of Things, mobility and cloud in its endeavors. Microsoft will focus on providing "digital work" and "digital life" experiences for its customers, according to the letter. The foundation of these experiences will be centered on connecting "sensors, screens and devices," and generating insights from these experiences. "We will create more natural human-computing interfaces that empower all individuals," Nadella wrote. "We will develop and deploy secure platforms and infrastructure that enable all industries. And we will strike the right balance between using data to create intelligent, personal experiences, while maintaining security and privacy." Nadella also emphasized collaboration. He said Microsoft's mission will be to "harmonize the world's devices, apps, docs, data and social networks in digital work and life experiences" in order to empower users to do more with technology. "Productivity for us goes well beyond documents, spreadsheets and slides. We will reinvent productivity for people who are swimming in a growing sea of devices, apps, data and social networks," he wrote. 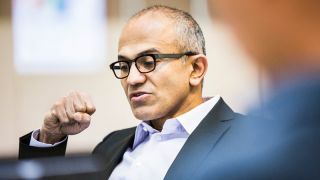 The company's cloud operating system infrastructure, device operating systems and first-party hardware will be built to "enable broad ecosystems" in order to improve collaboration and productivity, Nadella wrote. Microsoft will begin to create apps that will be designed to partition data between work and home use. The apps will also be built so that people can use the apps regardless of which device they're working on. Most of the information contained in Nadella's letter is evident in Microsoft's recent initiatives. It announced on July 9 the release of three new Office 365 licenses for small and mid-size businesses (SMBs). The new plans will replace Microsoft's existing Office products for SMBs. Changes include price reductions, increased seat caps and more flexibility to upgrade to Office 365 Enterprise. Microsoft also launched the StorSimple 8000 series hybrid storage arrays, which include two new Azure-based capabilities to centralize data management. Both platforms leverage Azure Storage as a hybrid cloud tier for automatic capacity expansion and off-site data protection. In addition to collaboration and cloud, Microsoft has been busy building out a mobile device management and data intelligence footprint.